Christmas is upon us and it’s time for another update in my gold cap challenge! This was week two of 8.1. I have kept up with Sinister combatant gear crafting and I am still getting a very nice volume of sales. 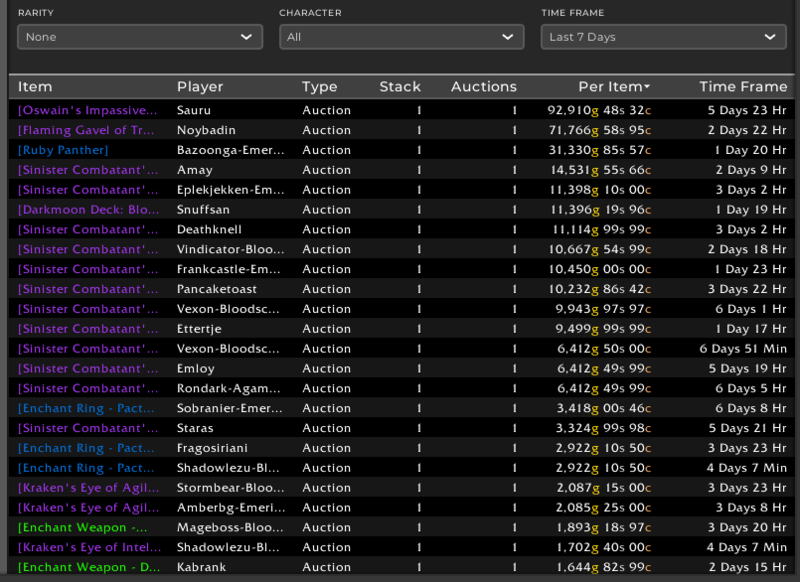 BoEs have been really slow, and I am strongly considering slashing my prices to move on from my stock in preparation for Dazar’alor. 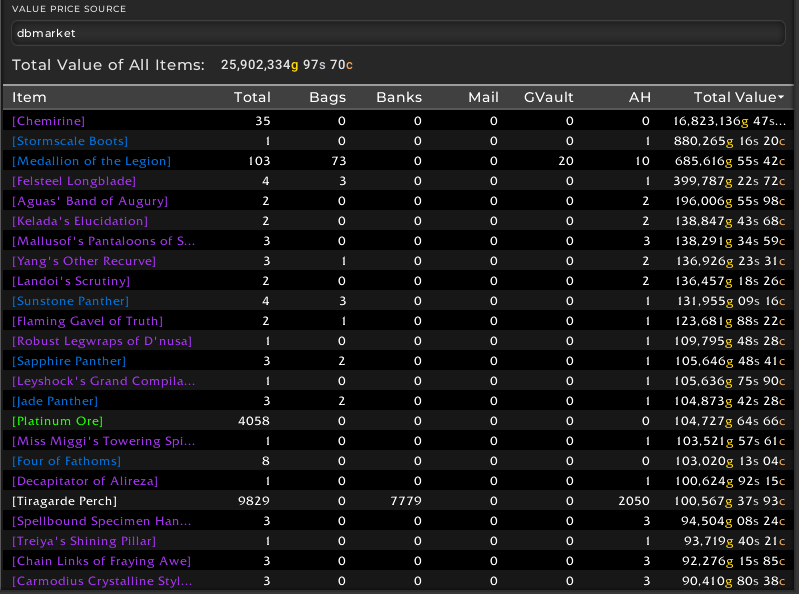 My total sales this week were quite weak, only totaling 469k gold. I didn’t spend too much as I am not currently buying BoEs, so that will help keep my liquid gold increasing even if my sales are quite low. Hopefully the next raid will bring BoE sales back in a bigger way. We can see that my week was very slow in the first half, before getting some slightly bigger mailboxes from Wednesday and out. Hopefully I can increase my sales as we go into January. My sales this week are overall quite disappointing. 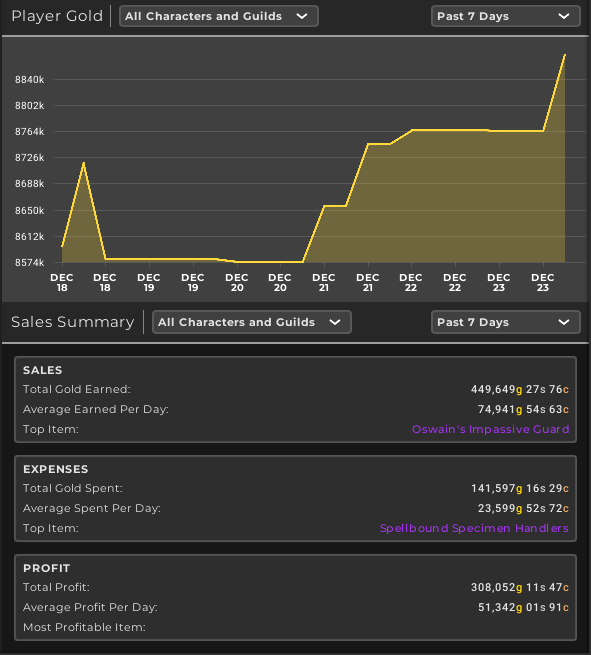 I only sold two BoEs, which will heavily bring down my total sales volume in terms of gold. At least I sold a decent number of Sinister combatant pieces which brought in some gold. Enchants and gems are still going well, but not making me rich alone. At this point the new raid BoEs in January will have to deliver. I will cut prices on the BoEs I have to help get some more sales before the next raid opens as I have a lot of stock I want to get rid of. I’ve been selling off a nice amount of the materials I bought before 8.1, but i haven’t managed to make any new material flips lately, so overall the sales volume here is very low. My resale summary for the last 7 days has zero entries. I may have to dive harder into material flipping again with BoE flipping being so slow. My inventory is almost exactly like it was last week. Main take away is that I need to move as many as possible of my BoEs over Christmas. Hopefully I can get them all out, as that would instantly finish the challenge even at low prices. 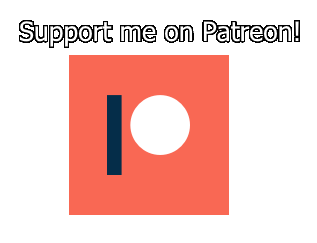 Follow me on twitter and twitch to keep up to date with my challenge. 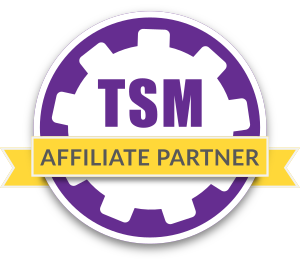 I’m streaming on Mondays at 20 CET and Wednesdays at 21 CET!